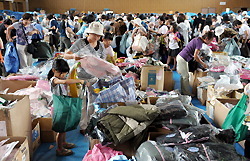 Relief supplies for colder season such as clothes were distributed to victims in Ohfunato City on September 17. These relief supplies has been sent from all over Japan and kept in the city hall. Victim citizens lined up in front of the municipal gymnasium where distribution was held before opening, and about 2,000 people visited there altogether. Each of them waited his or her turn and selected suitable winter clothes within the scheduled hours in the distribution center.